Conveniently situated a half mile from Fruitvale BART, minutes away from downtown Oakland and the commercial corridor of Alameda’s Park Street, Artthaus Studios is able to provide its tenants with the best amenities that Oakland and Alameda have to offer. Get a glimpse into the local art community by doing the monthly 2nd Friday Art Walk, when dozens of art galleries open up their spaces to promote art and culture in Alameda and Oakland's Jingletown. Participants change each month, but it’s generally along the art spaces down Park Street between 6 and 9pm. The Bay Area loves restored movie houses, and the Alameda Theater is no exception. This 1932 Art Deco theater was restored in 2008 and has since become a center of entertainment for the area. Catch a flick in the historic landmark and enjoy food delivered straight to your theater seats from Cinema Grill. Once known as the Coney Island of the West, the Crown Memorial State Beach is a protected public parkland that features a 2.5-mile stretch of sand that is ideal on warm days. A hub of coastal activities, the beach is well-known for windsurfing, has a bike trail along the shore, and has the family-friendly Crab Cove Visitors Center which highlights flora and fauna of the San Francisco Bay. Owner Mike Wang offers anything and everything that you can do on a SUP board including sessions out on the water, SUP yoga, beginner lessons and everything in between. See the San Francisco skyline from the water or take a board out to Rock Wall Wine Company, Mosley's Cafe, and even Treasure Island. Mike will make all of your SUP dreams come true. Stacked Adventures offers all things kayak with its kayaking excursions and lessons around the bay. Alameda is known for its Victorian houses (1 for every 25 people!) and antique stores, but the monthly Alameda Point Antiques Faire, held on the first Sunday of every month, shows how deep the vintage appreciation really goes. Located on the former Navy base, the Faire is the largest in Northern California, with more than 800 vendors selling everything from cool vintage finds, to furniture and housewares, to flat out weird stuff. It’s worth a visit for the gorgeous views if nothing else, and maybe you’ll find that vintage bomber or china collection you never knew you needed. When Keba Konte opened his coffee company, Red Bay, he was determined to flip the cliché gentrification script, and created a radical business model in which he shares business profits with his employees in addition to their tips and wages. It’s been growing ever since – both for its great coffee and great karma – and the second Fruitvale location opened last year inside Red Bay’s production headquarters. It’s a beautiful industrial space to enjoy a coffee, where you can learn about its production right before your eyes, and they have even expanded to hosting events. Opened in 2014 by Bay Area native, Beth Woulfe, and Christian Fidelis de Goes, who met while working at Bouchon Bakery in New York, Crispian Bakery is their baking dream come alive and the neighborhood has been benefiting ever since. With a focus on French-inspired American breads, cookies, pastries and other seasonal-baked goods, Crispian is a perfect neighborhood bakery that consistently delivers delicious creations. Located in the ground floor of the original Masonic Lodge that was built in 1891, The Local has quickly become a neighborhood staple since opening last year. Offering a full menu, great coffee, the beloved Mexican hot chocolate and selections from Alameda Island Brewing Co on tap, the eatery’s real draw are the friendly owners and the sense of community. Opened in 1989 by Guadalajaran native, Ramon Pena, Peña’s Bakery has been a favorite ever since for its flaky empanadas, glazed conchas, pan dulce and other homemade treats. Stop-by this Fruitvale bakery at any time for a true example of the roots of the neighborhood. Rick Kellner opened Feel Good Bakery in the Alameda Marketplace in 2004 with a mission to “raise the bar on bread” using the highest quality ingredients and techniques possible. Fourteen years later Feel Good is still serving up some of the best baked goods in the area, and all using organic, non-GMO, locally sourced ingredients from local vendors. The result is a local pride that delivers tasty baked goods that, well, feel good too. American Oak is an upscale gastropub located in downtown Alameda that offers elevated steaks, burgers, hot wings and other American fare. The restaurant also features over 200 labels of whiskey from malt, rye, bourbon and Scotch labels so if you love whiskey, this is definitely your spot. Once you've tasted 100 of their whiskeys, you can even become a member of the "Personal Liberty League" and receive a custom-etched glass with your name on it. Cheers to that! The SF fave has made its way to the East Bay and this Alameda location is just as bustling as the original. Sample the exotic and delicious flavors of Burma in this small eatery, just be sure to go early as the wait times can be long. Sit on the patio of this French eatery and enjoy a croissant and café au lait as you watch life going by. Café Jolie offers breakfast, lunch and dinner, as well as brunch on weekends and live jazz on occasion. We love this little bit of Paris in Alameda. Domenico’s is run by an Italian family that has had a presence in Alameda for over 50 years. After immigrating to the US from Italy in 1954, husband and wife team Letizia and Domenico opened their first Italian deli on Park Street in 1966. Domenico’s is their second deli, and the neighbors have been lining up for their authentic Italian sandwiches ever since opening in 1982. Now run by the next generation, Domenico’s continues to stay true to its roots and, thankfully, hasn’t changed a beat. Tucked away along the Oakland Estuary, Dragon Rouge is a Vietnamese Bistro known for its inventive Vietnamese dishes. Enjoy their great happy hour on the outdoor patio and take in views of the Park Street Bridge, or come by on weekend nights for the lively bar scene. While there are many food trucks to choose from in Fruitvale, the food truck in the parking lot of the Guadalajara Restaurant has got to be a favorite for its tastiness and frankly, portion sizes too. Their burritos are humongous, but we’re not mad at that when so much love gets poured into them. Local favorite, Julie’s, is beloved by the community for its great coffee, tea, kombucha, tonics, tasty breakfast, fresh lunch options and generally cozy atmosphere. Enjoy Julie’s healthy selection while eating inside among local art or lounge in the back garden where you may never want to leave. Mariscos La Costa is a casual, open-air taqueria stand, that offers Mexican staples and killer seafood plates. The oysters on the shell, crispy ceviche tostadas, seafood coctel floats in tomato broth, or octopus tostadas are all fresh, vibrant and hit the spot with lime, cucumber and an agua fresca. Mosley’s is a small dockside café in the Grand Marina that has a simple menu serving coffee, pastries, sandwiches and beer. Grab a stool and watch the boats cruise by as you hide out in this little gem enjoying your morning coffee or afternoon beer. Meet your new weekend brunch spot, Neptune’s - a bright airy space, with colorful details, stylish decor and patio seating that features gorgeous plates of elevated seasonal fare. Despite only being open a little over a year, people are already lining up on the weekends for fun brunches of chilaquiles, Persian-style frittata, Biscuit Benedict and Farmers Scramble, and with its location so close to the water, you could walk off lunch along the beach making for a beautiful way to spend a Sunday. When Eater selected chef/owner Nite Yun for their 2018 “Young Guns” list, they called her restaurant, Nyum Bai, “easily one of the Bay Area’s most exciting restaurants right now.” An ode to Yun’s heritage, Nyum Bai showcases the best of Cambodian culture from its authentic and delicious eats, to the 1960s Cambodian rock soundtrack in the background, all with a modern California twist. Since we are lucky enough to have it right in our back yard, we suggest you give it a try before the masses catch on. Not a lot has changed since Ole’s opened in 1927, and that’s exactly why locals love this Park Street mainstay. Enjoy the retro diner feel as you feast on the light and crispy signature waffles or anything else from their classic breakfast menu served all day. “Among the many taquerias along International Boulevard in Oakland’s Fruitvale neighborhood, this decade-old establishment serves some of the best tacos I’ve had not only in the Bay Area, but in California.” Strong words from food critic Bill Addison, but ones we’re willing to go with. Try the classics like al pastor, carnitas, chorizo and if you really know what you’re doing enjoy the tripe and cabeza which are the true standouts. Plus, they have a huge salsa bar which is always a winner in our book. Brought to you by the same people who own the longtime hit Little Star Pizza in SF, The Star on Park brings the same great Chicago-style deep dish pizza and is a welcomed addition to Alameda. Run by Italian-born Giuseppe Naccarelli and his wife Christine, Trabocco features fresh and delicious wood-fired pizzas, homemade pastas, and seafood dishes with a regional spin from chef Naccarelli’s hometown in Abruzzo, Italy. There is also an excellent cocktail menu that features Alameda-made spirits enhancing the Alameda-meets-Abruzzo synthesis of Naccarelli’s first US restaurant. Claiming to be Oakland’s “oldest and largest brewery,” Ale Industries is also perhaps its most experimental and eco-friendly. Since it opened in 2009, Ale Industries has been known for its creative and open-minded approach to beer-making which has earned much respect in the industry and within the local community. 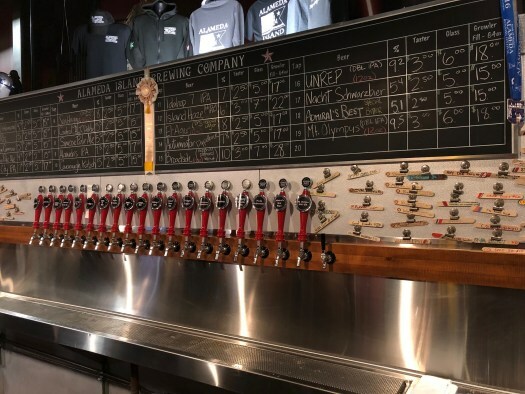 The taproom in the revitalized Fruitvale District offers over a dozen beers on tap in an inviting warehouse space that showcases local art, and makes for a great spot to kick back with their signature Cherry Kush and take in the local scene. Well known for its Island City IPA and other craft beer, Alameda Island Brewing Company is a 10,000 square foot microbrewery that opened in 2015 and produces beers that are widely offered in restaurants in the area. Enjoy a flight of fresh brews in their tasting room, outdoor patio, or at the newly opened Monkey King at the Brewery food counter. Located in the historic Alameda Theater Complex, Alameda Wine Company is an oenophile expression of love by its owner, Ken Urlich, who opened this wine bar to highlight “superior small-production, hand-crafted wines from around the world” at a great value. Patrons are encouraged to try any of the 250 hand-selected bottles before they purchase a bottle, or they can simply linger at the bar for the evening. What once was a Marine Corps helicopter hangar on the old Alameda Naval Base, is now a 25,000 square foot brewery serving 20+ original brews alongside sweeping views of the SF skyline and Bay Bridge. Featuring local favorites like the A-Town Pale (which is only available in Alameda), alongside murals painted by local artists, the family-run Faction Brewing is a proud reflection of Alameda’s past and present. Unique cocktails, draft beer and Asian pub grub plates keep the crowds coming back to this boisterous local haunt. 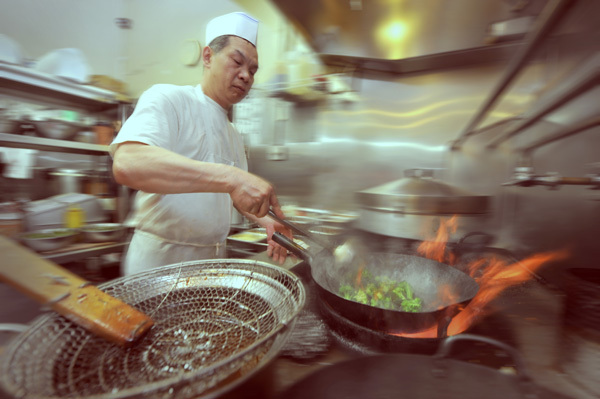 Favorites include fried chicken baskets and garlic noodles which satiate the patrons during Monkey King’s long happy hours. Nothing churchy about this spot. During the day, locals gather to shoot some pool, watch a game or enjoy the happy hour, but come nightfall the place converts into a dance club with live DJs mixing it up for a younger crowd. Housed in a 1944 naval warehouse, Admiral Maltings is California’s first craft Malthouse since prohibition, which means they create their own beer malt on-site in their malting facility floor (a rarity in a world where even small craft breweries source their malt from large suppliers). The Rake is the new taproom/bar which showcases the 20+ draft and cask beers brewed with the Admiral malt and it’s quite a treat to enjoy some of the best brews in the Bay Area while watching them rake the malt before your eyes. Sitting in a converted hangar near Faction, Rock Wall Winery is an urban winery run by Kent and Shauna Rosenblum, two heavy weights in the East Bay wine making scene. Combining the best grapes from nearby Sonoma, Napa and other valleys in the region, Rock Wall offers killer wines which you can sample in the tasting room or on the back deck with views of the Bay. Located on Alameda’s Spirits Alley, St George Spirits is an industrial distillery that has been crafting whiskey, gin, brandy and other spirits since 2002 way before the area began its revitalization. Most notably St. George was the first American company to release an absinthe after the U.S. ban was lifted in 2007 and still produces one of the most highly regarded on the market. Tour the sprawling space or book a tasting to enjoy the spirits on offer. Family-owned and operated, Homeskillet, is a local breakfast spot that serves classic American diner food, but the real draw are their fresh doughnuts made in house every day. Go for a classic or try one of their creative creations like the matcha green tea glaze. Tucked away in the Fruitvale Public Market is this unassuming ice cream shop run by Luis Abundis who has been lovingly churning out ice cream since 1991. Offering creative rotating ice cream flavors based on seasonal ingredients like rose petal, corn, and guava, as well as raspados (snow cones) like pecan and chile pepper, all of the ingredients are fresh, natural and hand-churned in small batches. The result is a high-quality product, for a low-key price, that has been making locals happy for years. An Alameda institution since its opening in 1941, Tucker’s prides itself on fresh ingredients, family recipes and a sense of community. The milkshakes are extra thick, the scoops are traditional, and the history is palpable at this multi-generational gathering place.